Two modes: for Developers and Auditors. Continuous Integration (CI) through MSBuild. For Unix CI runners please use VS2017 NuGet package. See Continuous Integration Builds section for instructions. 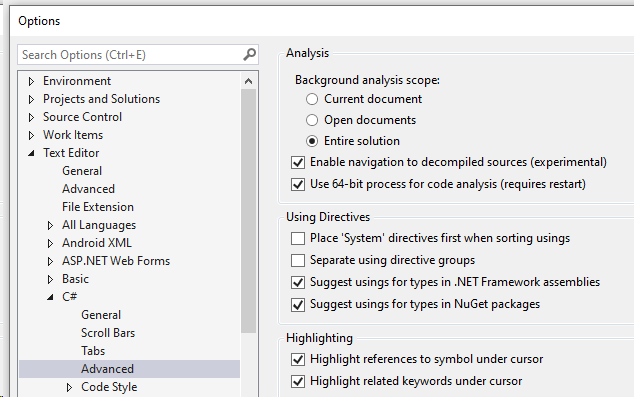 Installing it as NuGet package gives an advantage to choose projects in a solution that should be analyzed. It is a good idea to exclude test projects, because they do not make it into a final product. However it requires discipline to install SCS into every solution a developer works with. Installing it as a Visual Studio extension is a single install action. The NuGet version runs during a build and in background as IntelliSense (VS extension provides IntelliSense only) and can be integrated to any Continuous Integration (CI) server that supports MSBuild. git clone or copy by other means the sources to a local directory. dotnet add src/SourcesFolderName/ProjectName.csproj package SecurityCodeScanVS2017 to reference SCS NuGet package in specific project file. Repeat for every project you want to analyze. Strictly speaking the step is not necessary if the SCS NuGet package is already referenced in project during development. Since Full solution analysis for IntelliSense has performance impact this is another reason to use SCS during a build only as a NuGet instead of Visual Studio extension. Microsoft has some additional information on the configuration option. Write-Host "AdditionalFileItemNames missing in $_"
There are two types of external configuration files that can be used together: per user account and per project. It allows you to customize settings from built-in configuration or add new rules. Global settings file location is %LocalAppData%\SecurityCodeScan\config-2.0.yml on Windows and $XDG_DATA_HOME/.local/share on Unix. 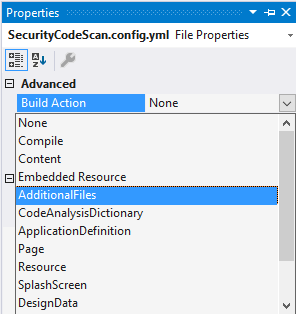 For project specific settings add a file named SecurityCodeScan.config.yml into a project. ⚠️Note: The file name doesn’t have ‘2.0’. Instead it must have Version: 2.0 configuration setting in it’s content. If the setting is missing you will get a runtime analysis exception. See the configuration file for comments and examples of usage. Audit mode is off by default. It can be turned on in an external configuration file to get more potentially false positive warnings about data with unknown taint state. It is possible to filter shown item in Error List by different criteria: warning id, project name, etc. You can permanently suppress entire warning type for a project by setting it’s warning id severity to None. Microsoft has it’s own documentation about suppressions, rule sets and severities. If no SCS warnings are displayed, temporarily disable other installed analyzers. A buggy analyzer may affect results from other analyzers. The dynamic value passed to the command execution should be validated. If a malicious user controls either the FileName or Arguments, he might be able to execute unwanted commands or add unwanted argument. This behavior would not be possible if input parameter are validate against a white-list of characters. The dynamic value passed to the XPath query should be validated. If the user input is not properly filtered, a malicious user could extend the XPath query. The XML parser is configured incorrectly. The operation could be vulnerable to XML eXternal Entity (XXE) processing. settings.ProhibitDtd = true; // default is false! settings.DtdProcessing = DtdProcessing.Prohibit; // default is DtdProcessing.Parse! xmlDoc.XmlResolver = null; // Setting this to NULL disables DTDs - Its NOT null by default. In .NET Framework versions 4.5.2 and up, XmlTextReader’s internal XmlResolver is set to null by default, making the XmlTextReader ignore DTDs by default. The XmlTextReader can become unsafe if if you create your own non-null XmlResolver with default or unsafe settings. A path traversal attack (also known as directory traversal) aims to access files and directories that are stored outside the expected directory.By manipulating variables that reference files with “dot-dot-slash (../)” sequences and its variations or by using absolute file paths, it may be possible to access arbitrary files and directories stored on file system including application source code or configuration and critical system files. With a malicious relative path, an attacker could reach a secret file. Do not try to strip invalid characters. Fail if any unexpected character is detected. If the input is not supplied by user or a validation is in place the warning can be suppressed. The dynamic value passed to the LDAP query should be validated. If the user input is not properly filtered, a malicious user could extend the LDAP query. SQL injection flaws are introduced when software developers create dynamic database queries that include user supplied input. Malicious user might get direct read and/or write access to the database. If the database is poorly configured the attacker might even get Remote Code Execution (RCE) on the machine running the database. Unsafe usage of System.Web.UI.WebControls.SqlDataSource, System.Web.UI.WebControls.SqlDataSourceView or Microsoft.Whos.Framework.Data.SqlUtility. FROM Employees WHERE EmployeeID = ?" Use parametrized queries to mitigate SQL injection. Disabling certificate validation is often used to connect easily to a host that is not signed by a root certificate authority. As a consequence, this is vulnerable to Man-in-the-middle attacks since the client will trust any certificate. The random numbers generated could be predicted. The use of a predictable random value can lead to vulnerabilities when used in certain security critical contexts. MD5 or SHA1 have known collision weaknesses and are no longer considered strong hashing algorithms. Use SHA256 or SHA512. Notice, that hashing algorithms are designed to be fast and shouldn’t be used directly for hashing passwords. Use adaptive algorithms for the purpose. DES and 3DES are not considered a strong cipher for modern applications. Currently, NIST recommends the usage of AES block ciphers instead. Broken or deprecated ciphers have typically known weakness. A attacker might be able to brute force the secret key use for the encryption. The confidentiality and integrity of the information encrypted is at risk. Use AES for symmetric encryption. The CBC mode alone is susceptible to padding oracle attack. If an attacker is able to submit encrypted payload and the server is decrypting its content. The attacker is likely to decrypt its content. //No HMAC suffix to check integrity!!! See the Solution in Weak Cipher Mode. The ECB mode will produce identical encrypted block for equivalent plain text block. This could allow an attacker that is eavesdropping to guess the content sent. This same property can also allow the recovery of the original message. Furthermore, this cipher mode alone does not guarantee integrity. Mode = CipherMode.ECB, // !!! Use some other mode, but notice that CBC without authenticated integrity check is vulnerable to another type of attack. For an example of authenticated integrity check see the Solution in Weak Cipher Mode. The cipher text produced is susceptible to alteration by an adversary. The cipher provides no way to detect that the data has been tampered with. If the cipher text can be controlled by an attacker, it could be altered without detection. The use of AES in CBC mode with a HMAC is recommended guaranteeing integrity and confidentiality. It is recommended to specify the Secure flag to new cookie. The requireSSL value is explicitly set to false or the default is left. It is recommended to specify the HttpOnly flag to new cookie. The httpOnlyCookies value is explicitly set to false or the default is left. The viewStateEncryptionMode is not set to Always in configuration file. Web Forms controls use hidden base64 encoded fields to store state information. If sensitive information is stored there it may be leaked to the client side. The view state could be altered by an attacker. Request validation is disabled. Request validation allows the filtering of some XSS patterns submitted to the application. Always user proper encoder (Html, Url, etc.) before displaying or using user supplied data (even if it is loaded from database). The validateRequest which provides additional protection against XSS is disabled in configuration file. The requestValidationMode which provides additional protection against XSS is enabled only for pages, not for all HTTP requests in configuration file. The password configuration to this API appears to be hardcoded. It is recommended to externalize configuration such as password to avoid leakage of secret information. The source code or its binary form is more likely to be accessible by an attacker than a production configuration. To be managed safely, passwords and secret keys should be stored encrypted in separate configuration files. The certificate for decryption should be installed as non-exportable on the server machine. The RequiredLength property must be set with a minimum value of 8. Weak password can be guessed or brute-forced. ASP.NET Identity default is 6. The minimal length of a password is recommended to be set at least to 8. PasswordValidator should have at least two requirements for better security (RequiredLength, RequireDigit, RequireLowercase, RequireUppercase and/or RequireNonLetterOrDigit). An attacker could send a link to the victim. By visiting the malicious link, a web page would trigger a POST request (because it is a blind attack - the attacker doesn’t see a response from triggered request and has no use from GET request and GET requests should not change a state on the server by definition) to the website. The victim would not be able to acknowledge that an action is made in the background, but his cookie would be automatically submitted if he is authenticated to the website. This attack does not require special interaction other than visiting a website. Having the annotation [OutputCache] will disable the annotation [Authorize] for the requests following the first one. The enableEventValidation is disabled in configuration file. This feature reduces the risk of unauthorized or malicious post-back requests and callbacks. It is strongly recommended that you do not disable event validation. 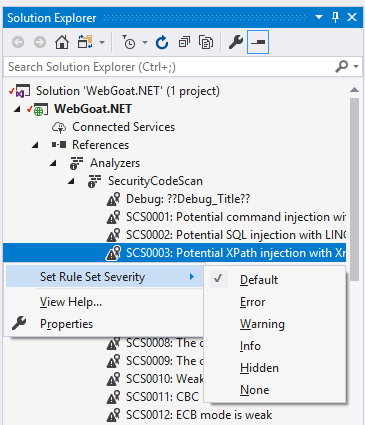 When the EnableEventValidation property is set to true, ASP.NET validates that a control event originated from the user interface that was rendered by that control. The dynamic value passed to the Redirect should be validated. Untrusted data passed for deserialization. Arbitrary code execution, full application compromise or denial of service. An attacker may pass specially crafted serialized .NET object of specific class that will execute malicious code during the construction of the object. There is no simple fix. Do not deserialize untrusted data: user input, cookies or data that crosses trust boundaries. 1) If serialization is done on the server side, then crosses trust boundary, but is not modified and is returned back (like cookie for example) - use signed cryptography (HMAC for instance) to ensure it wasn’t tampered. Pass the expected type (may be hardcoded) to the deserialization library. Some libraries like Json.Net, DataContractJsonSerializer and FSPickler validate expected object graph before deserialization. However the check is not bulletproof if the expected type contains field or property of System.Object type somewhere nested in hierarchy. // this makes some serializers fall back to a default binder, allowing exploits. Determining which types are safe is quite difficult, and this approach is not recommended unless necessary. There are many types that might allow non Remote Code Execution exploits if they are deserialized from untrusted data. Denial of service is especially common. As an example, the System.Collections.HashTable class is not safe to deserialize from an untrusted stream – the stream can specify the size of the internal “bucket” array and cause an out of memory condition. BlackHat USA 2012: Are you my type? Changes in SCS configuration file doesn’t require to restart Visual Studio anymore. Warnings are suppressed for generated code. Adds .NET Core cookie analyzer. This is a major release that introduces configurable taint sources, sanitizers and validators. Configuration file schema version has changed to 2.0, so if you had custom config settings, you’ll need to adjust to the schema and bump your file name from config-1.0.yml to config-2.0.yml or change from Version: 1.0 to Version: 2.0 if it was added to a project. With the introduction of taint sources and taint entry points warning are shown only for the tainted data. Unknowns are reported only in the Audit Mode. Multiple improvements and fixes were done to Taint, Anti-CSRF token, XSS, SQL injection, Path traversal, XPath injection, Certificate validation analyzers. New LDAP injection detection was added. I would like to thank all contributors to this and previous releases. Also to everyone who has reported issues or feature requests. Important: This release targets full .NET framework and may not run on Unix machines. Although as tested it runs fine in microsoft/dotnet 2.1 docker container on Linux, still for Unix based Continuous Integration builds it is better to use SecurityCodeScan.VS2017 NuGet package, that targets netstandard. Added external configuration files: per user account and per project. It allows you to customize settings from built-in configuration or add your specific Sinks and Behaviors. ⚠️Note: Configuration schema has changed in version 3.0.0 please refer to the documentation above for examples. Audit Mode setting (Off by default) was introduced for those interested in warnings with more false positives. VB.NET projects were not analyzed when using the analyzer from NuGet. Added warning for the usage of AllowHtml attribute. Different input validation analyzer and CSRF analyzer improvements. Exceptions analyzing VB.NET projects fixed. XXE analysis expanded. More patterns to detect Open Redirect and Path Traversal. Weak hash analyzer fixes. Added request validation aspx analyzer. False positives reduced in hardcoded password manager. The feature was broken. See how to enable. Added detection of request validation mode. Taint diagnostic messages include which passed parameter is untrusted. Weak hash analyzer. Added more patterns. Path traversal. Also added more patterns.